Fully Packed Panel with two three-prong 120V receptacles, one 12V DC receptacle and one 5V USB port With 6 Hour half running time, Ideal for powering lights, radio, TV, Small Appliances, RV AC, Laptop/Tablets, Cell Phones..
Advanced Powerful and Durable Inverter Technology, Automatically varies engine speed, Compact and Light Weight. ETQ generators powered American homes and business for years. Now new and better ETQ Generators are back under new management. With backup clean and quiet portable power, you have peace of mind. 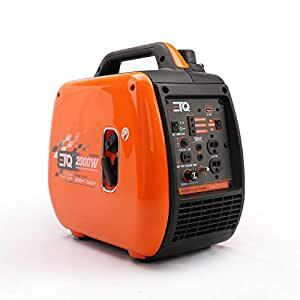 ETQ 2,000 Watt Inverter Generator produces clean energy free of voltage spikes and drops without making all of the noise of a regular generator. Generate 2000 surge watts and 1600 rated watts of power. Our 79.7 cc 4-stroke OHV engine operates at an extremely quiet 52 decibels at quarter load, quieter than a window air conditioner or the average conversation. This limits its invasiveness while hunting, camping, tailgating and restoring back-up power. Designed to mirror a pure sine wave, this generator limits total harmonic distortion to under 0.3 percent at no load and under 1.2 percent at full load, making it safe enough to run laptops, cellphones, monitors, tablets and other vulnerable electronics. The lightweight design makes for easy portability while the ultra-efficient one-gallon tank provides over 6 hours of half-load run time. This fully-packed panel comes equipped with two three-prong 120V receptacles, one 12V DC receptacle and one 5V USB port. Maximize fuel economy by engaging ETQ 2000 Watt Inverter Generator’s Eco-Mode Throttle. This feature allows the generator’s motor to automatically adjust its fuel consumption as items are plugged and unplugged from the panel, preventing the usage of unnecessary gasoline. Need more energy? Easily link up two generators in order to share wattage amongst multiple units. Low-oil and low-fuel automatic shutdown with indication lights along with overload protection safeguard both your generator and your electronics from damage. And because this is a ETQ Product, your inverter generator comes backed by a 1-year warranty, a nationwide network of skilled service technicians and a friendly customer helpline.